singapore noodles recipe | veg singapore noodles | singapore mei fun with detailed photo and video recipe. 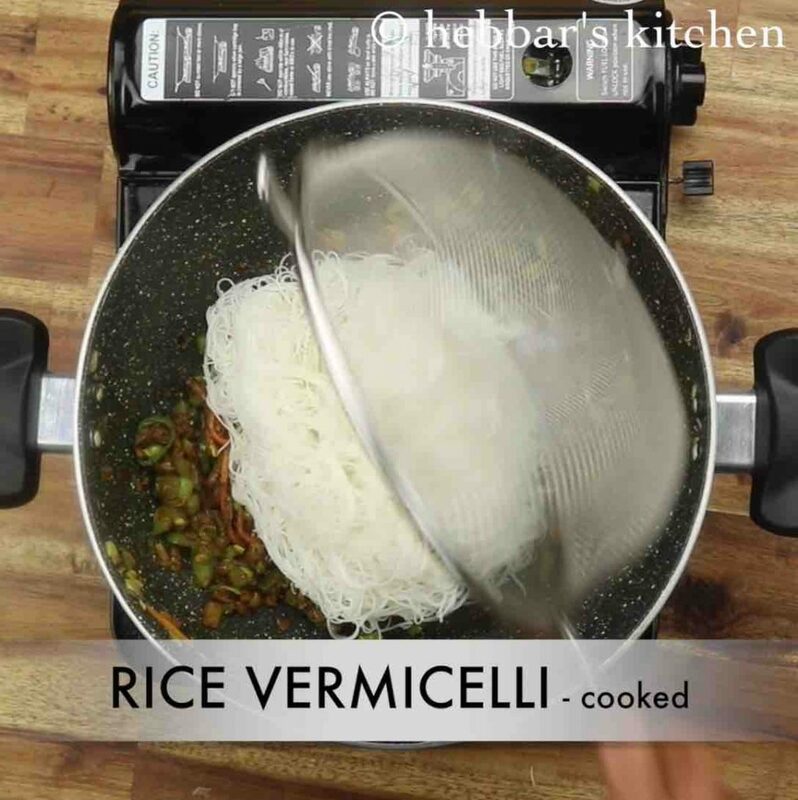 a unique, flavoured noodles recipe with thin rice vermicelli noodles and stir-fry vegetables. it is an ideal meal for lunch or dinner and in india it is generally served as a street food. 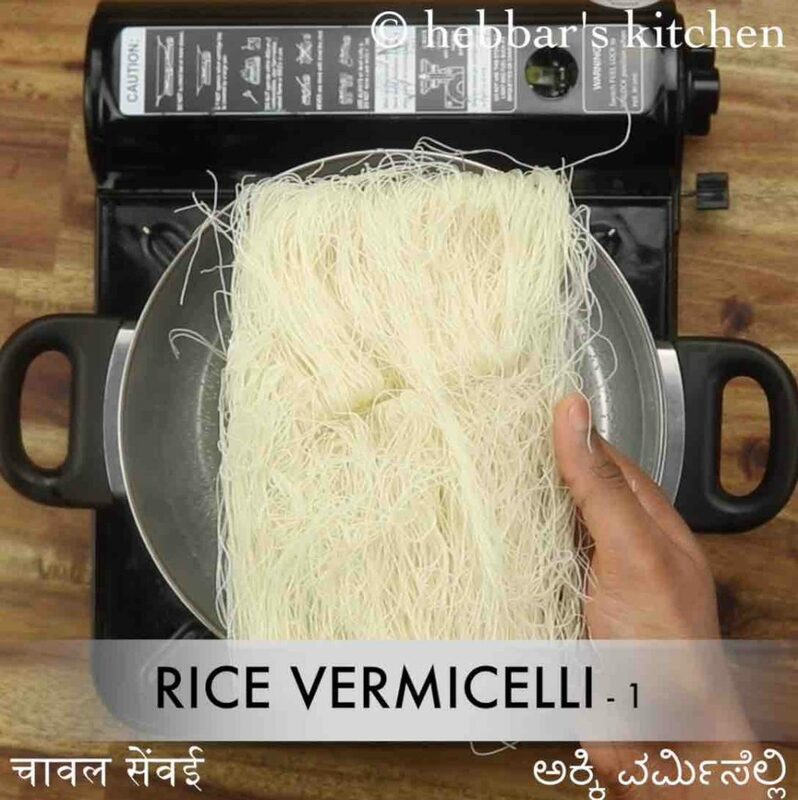 it is simple and easy to make and has a strong resemblance to our semiya or vermicelli upma recipe. 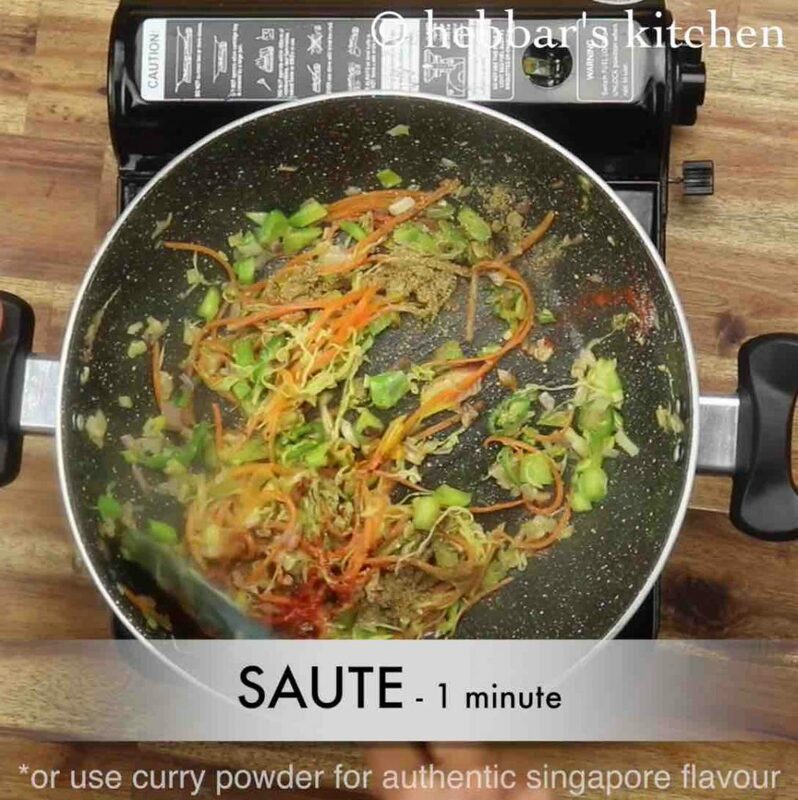 singapore noodles recipe | veg singapore noodles | singapore mei fun with step by step photo and video recipe. indian recipes have a lot of overseas influence and can be easily seen in typically in a cosmopolitan city. the more obvious cuisine influence is by the nearby countries and regions. one such easy and a flavoured recipe is singapore noodles which has a strong resemblance to our own vermicelli recipes. 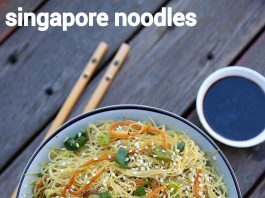 as i mentioned previously, singapore noodles recipes is very unique, and as i see it, it is a fusion of 2 cuisines. basically, you can see a combination of 2 recipes in it with chinese cuisine influence predominantly. at the same time, it is not just chinese recipes as most of the singapore recipes use curry powder which is evident in this recipe too. hence i would not hesitate to call this a fusion of indian and chinese cuisine. perhaps given the cosmopolitan nature of singapore city, it is self-explanatory. 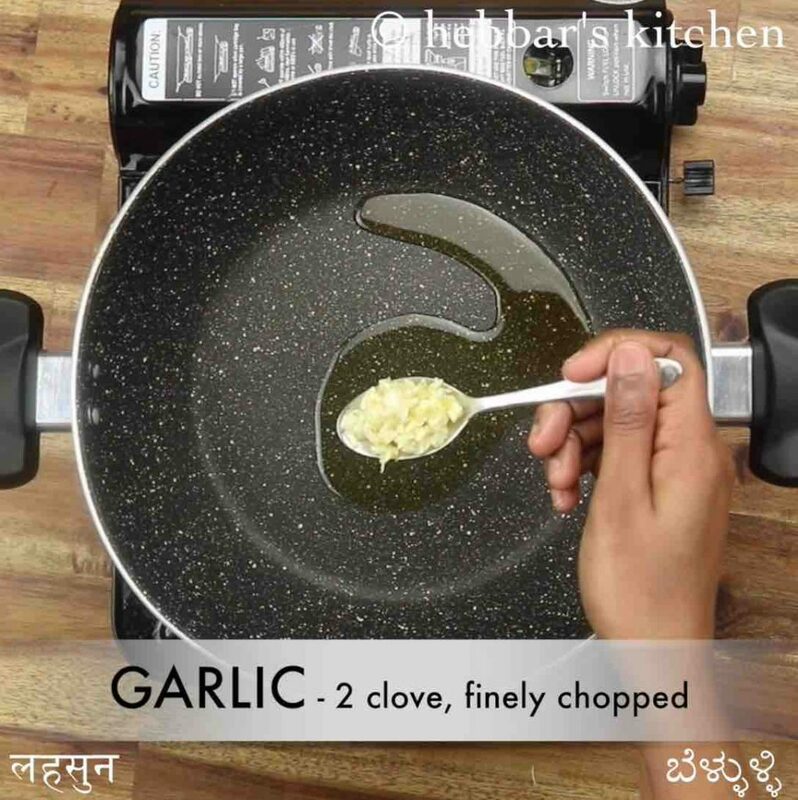 moreover, with the addition of curry powder it matches the taste buds of indian demographics and hence naturally this recipe is very well excepted in most urban cities. i personally like it as a change, i make this recipe for my breakfast and sometimes dinner which easily solves my purpose. 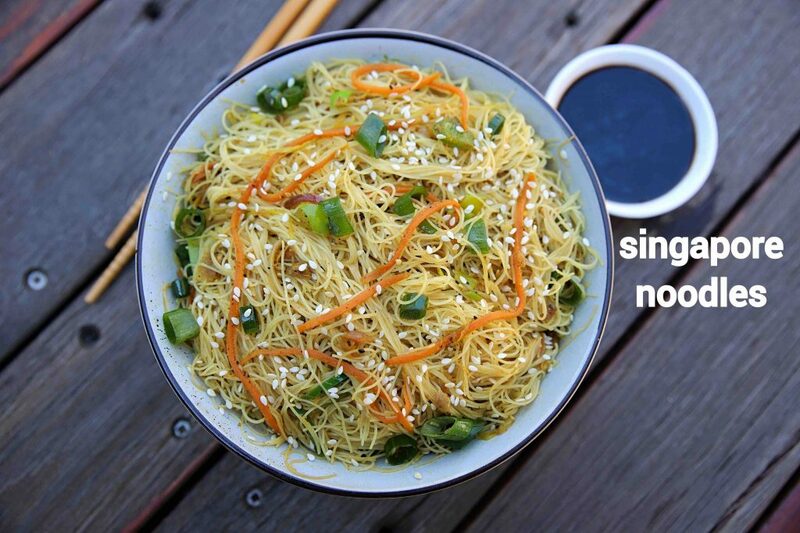 furthermore, i would like to add some tips and suggestions to make a perfect and flavoured singapore noodles recipes. firstly, and more importantly, this noodles recipe is generally served with a choice of meat protein or scrambled egg. but i have not used in this recipe, if you are comfortable having it, i would recommend adding it. 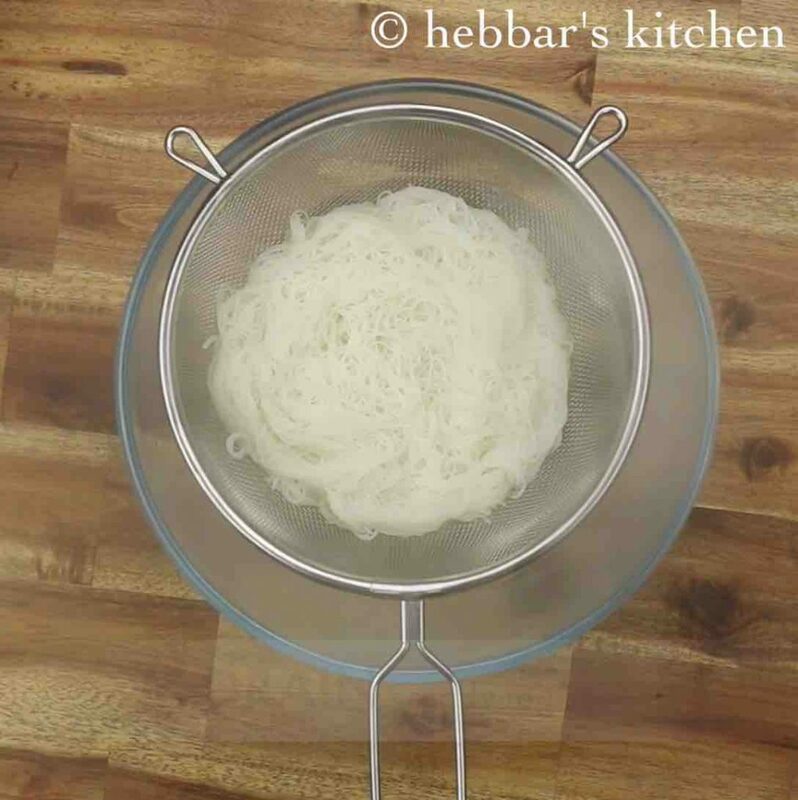 secondly, prepare the noodles by soaking in warm/hot water. do not overcook it or otherwise, it may turn mushy and sticky. 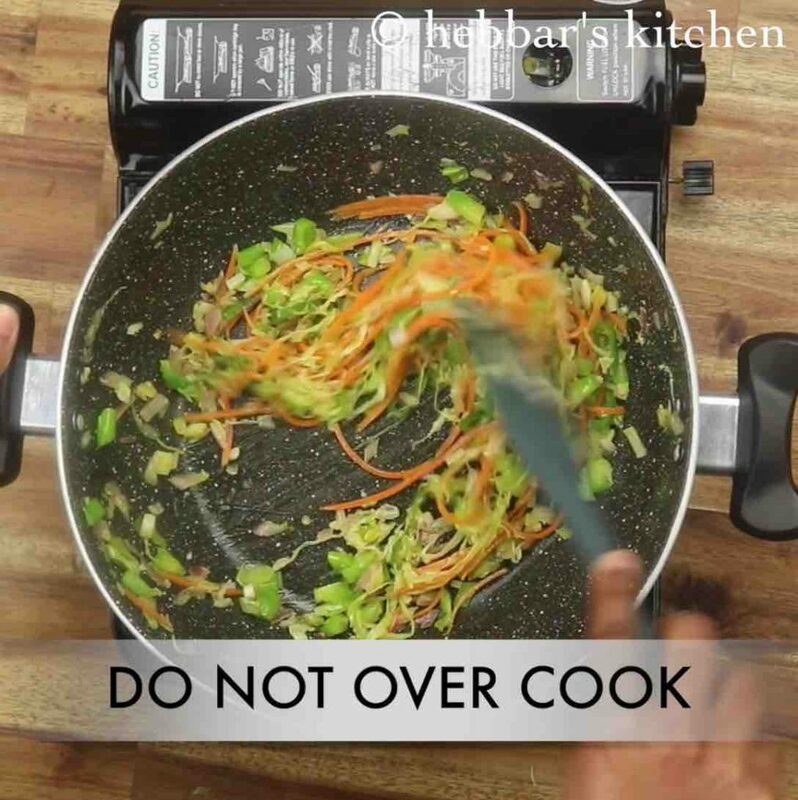 lastly, you can use your own choice of veggies to stir-fry and top it to the noodles. you can choose veggies like beans, broccoli, snow pea, mushrooms, choy sum, carrots and cabbage. firstly heat 2 tbsp sesame oil and saute 2 clove garlic, 1 inch ginger, 1 chilli and 2 tbsp spring onion. 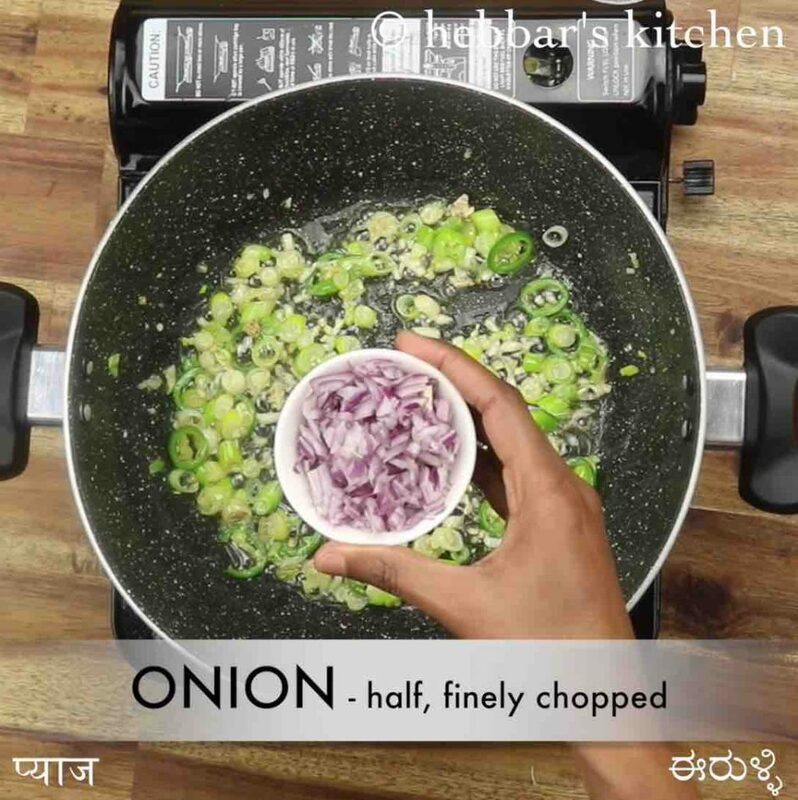 further, saute ½ onion until it slightly changes colour. 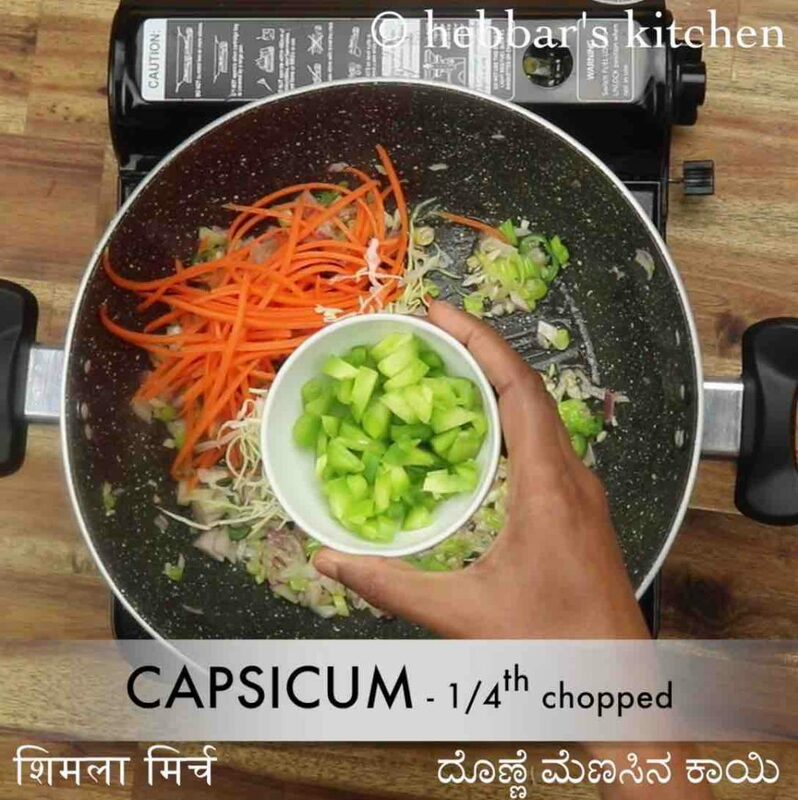 additionally add 1 carrot, ¼ cup cabbage and ¼ capsicum. 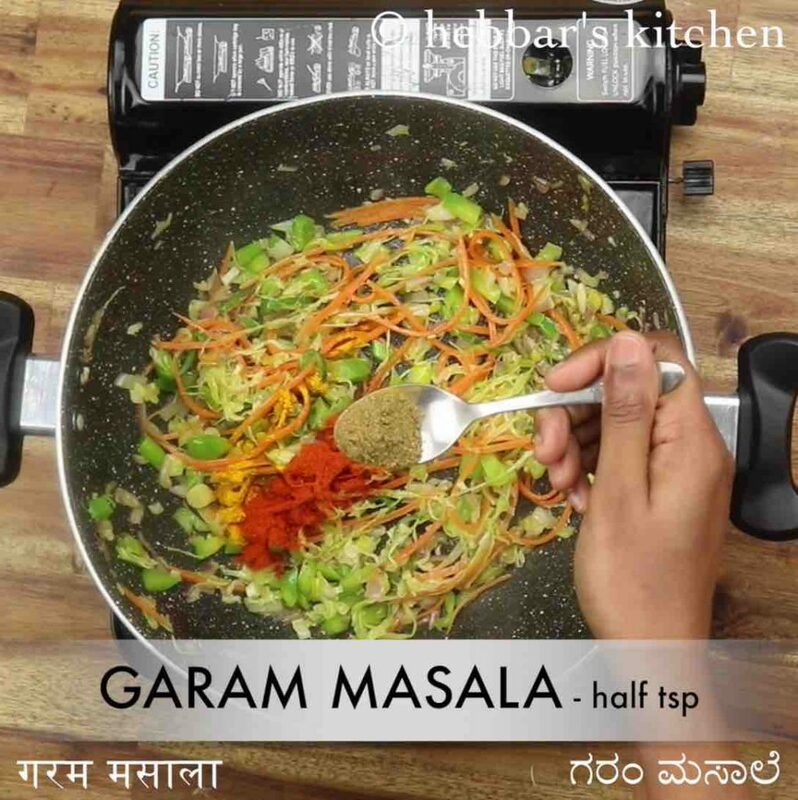 furthermore add ¼ tsp turmeric, ¼ tsp chilli powder, ½ tsp garam masala, ½ tsp coriander powder, ¼ tsp pepper and ½ tsp salt. saute on low flame without burning the spices. now add 2 tbsp soy sauce and mix well. 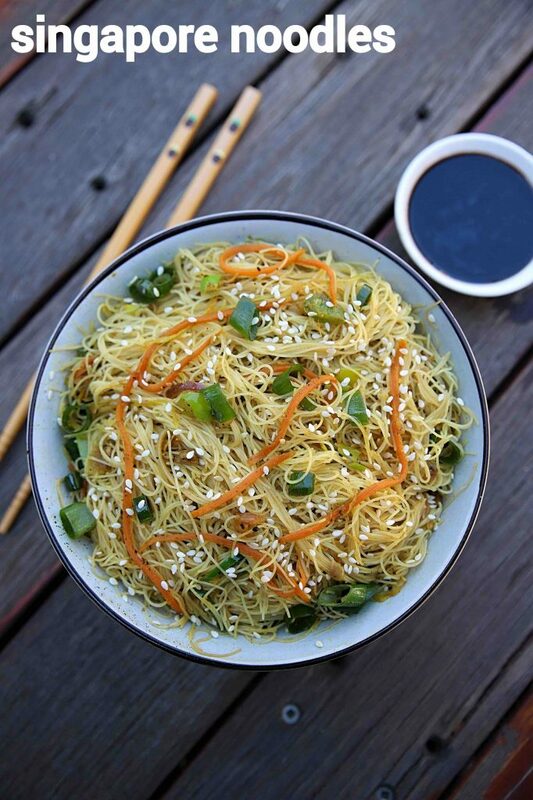 finally, enjoy singapore noodles topped with spring onions and roasted sesame seeds. firstly, in a large bowl boil 4 cup water. 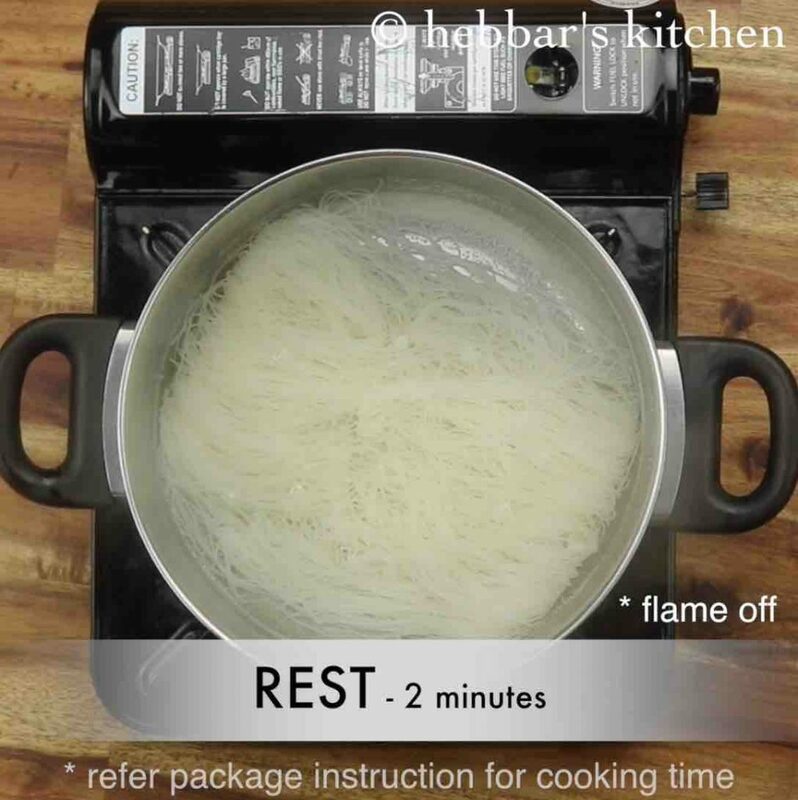 once the water comes to a boil, turn off the flame and soak in 1 pack rice vermicelli. 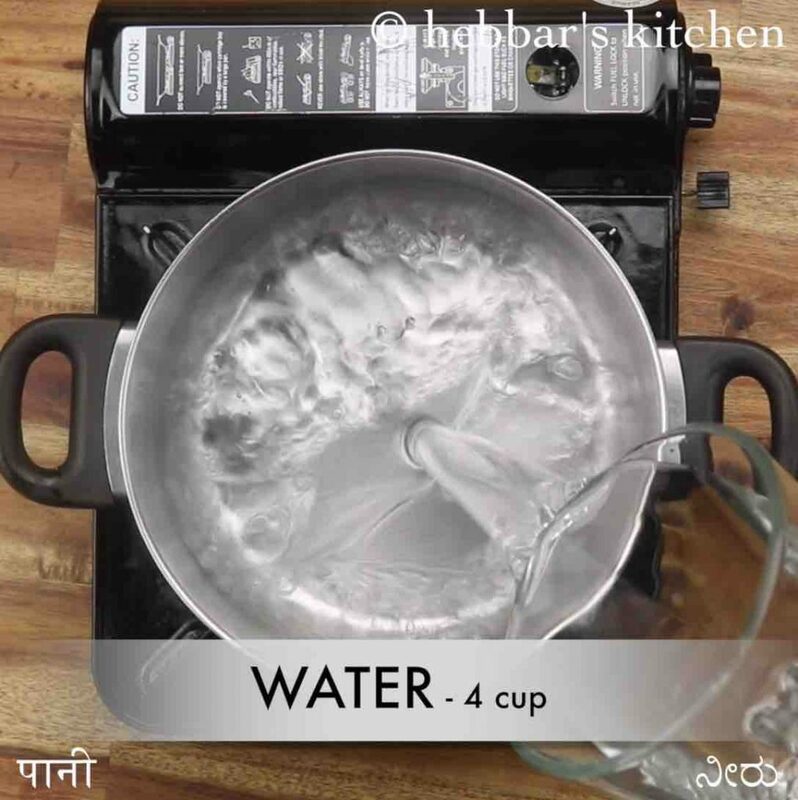 soak for 2 minutes or refer package instructions to know the cooking time. now in a large kadai heat 2 tbsp sesame oil and saute 2 clove garlic, 1 inch ginger, 1 chilli and 2 tbsp spring onion. firstly, add vegetables of your choice to make noodles more healthy and tasty. also, do not overcook noodles, else they turn mushy. 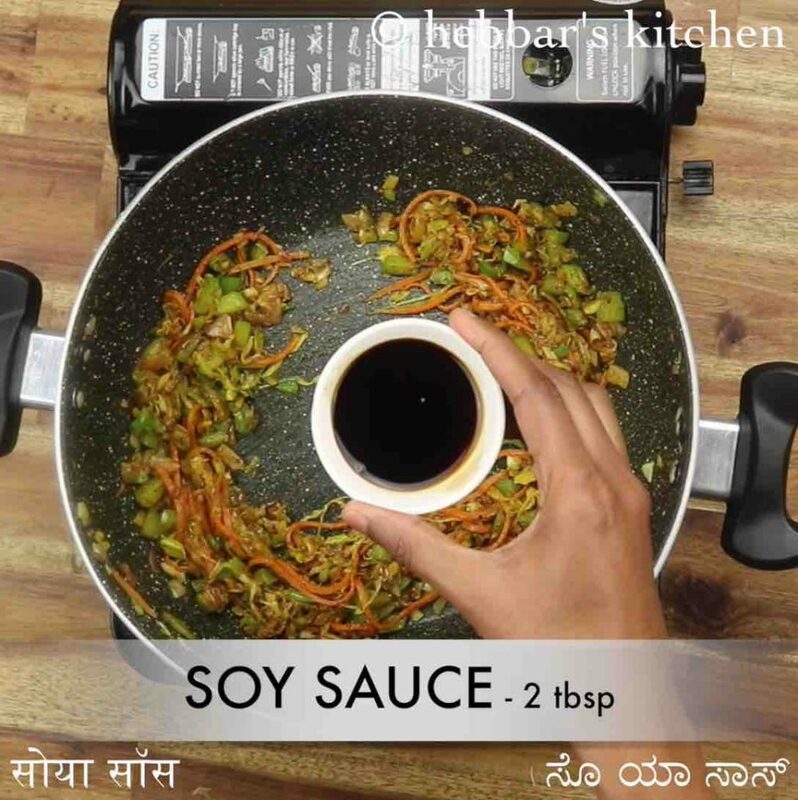 additionally, use sesame oil/groundnut oil for more rich flavour. furthermore, instead of using spice powders use curry powder. finally, singapore noodles recipe tastes great when served hot.